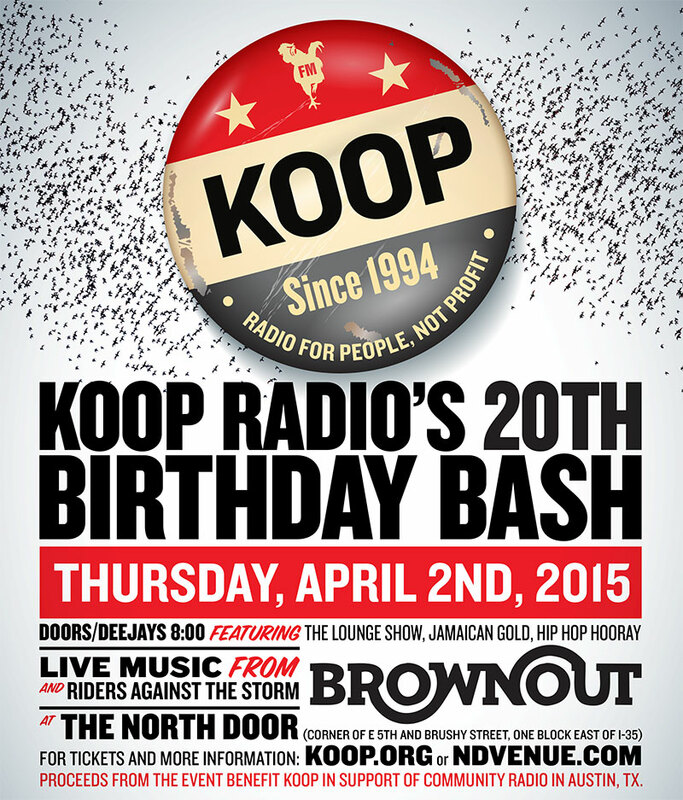 KOOP Radio 91.7 FM celebrates 20 years of community radio on Thursday, April 2, at The North Door with sets by hip-hop soul healers Riders Against the Storm and Latin psych-funk headliners Brownout. Heavy hitters from KOOP’s roster will spin records, including Jay Robillard of The Lounge Show, Art Baker of Jamaican Gold, Miss Manners of Hip Hop Hooray, and more! Master Pancake and Elk Mating Ritual raconteur John Erler will wreak havoc with his patented video-heckling comedy. And the emcee for the evening is KOOP and KUTX radio host Rick “Daddy” McNulty. KOOP will also give away 3 pairs of tickets at the party to see Stevie Wonder at the Frank Erwin Center! Buy your tickets now! They’ll be $25 at the door!